In 1540 Francisco Vasquez de Coronado introduced the first domestic livestock to the American Southwest. Over the subsequent four centuries, cattle, horses, and sheep have created a massive ecological experiment on these arid grasslands, changing them in ways we can never know with certainty. The Appleton-Whittell Research Ranch in the high desert of southeastern Arizona is an 8,000-acre sanctuary where grazing has been banned since 1968. 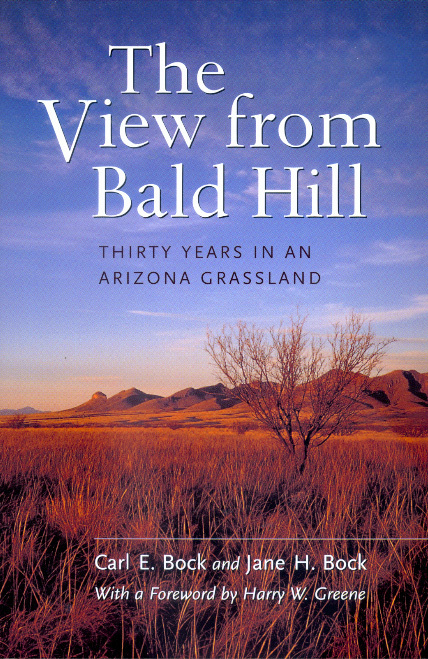 In this spirited account of thirty years of research at the ranch, Carl and Jane Bock summarize the results of their fieldwork, which was aimed at understanding the dynamics of grasslands in the absence of livestock. 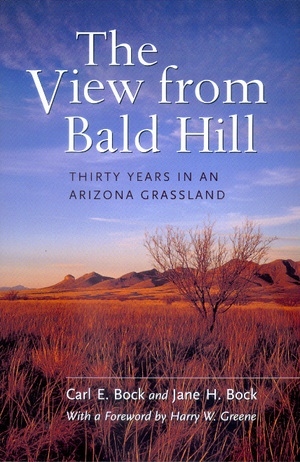 The View from Bald Hill provides an intimate look at the natural history of this unique site and illuminates many issues pertaining to the protection and restoration of our nation's grasslands. Carl E. Bock and Jane H. Bock are both Professors of Biology at the University of Colorado in Boulder. From 1980 to 1991 they were Research Directors at the Appleton-Whittell Research Ranch. Jane Bock is the coeditor, with Yan Linhart, of Evolutionary Ecology of Plants (1989).